The 567 Center for Renewal is available to rent for your next function. Our building is a popular space to rent for weddings, fundraising events, parties, and meetings. Our art gallery is about 1200 sq. ft. It can accommodate up to 50 people seated, or 75 people standing, and is suitable for smaller workshops, receptions, and business meetings. Our rates vary based on the space being used and the day and time of the event. We also offer discounts for non-profit organizations. To inquire about cost and availability, e-mail rentals@the567.org. 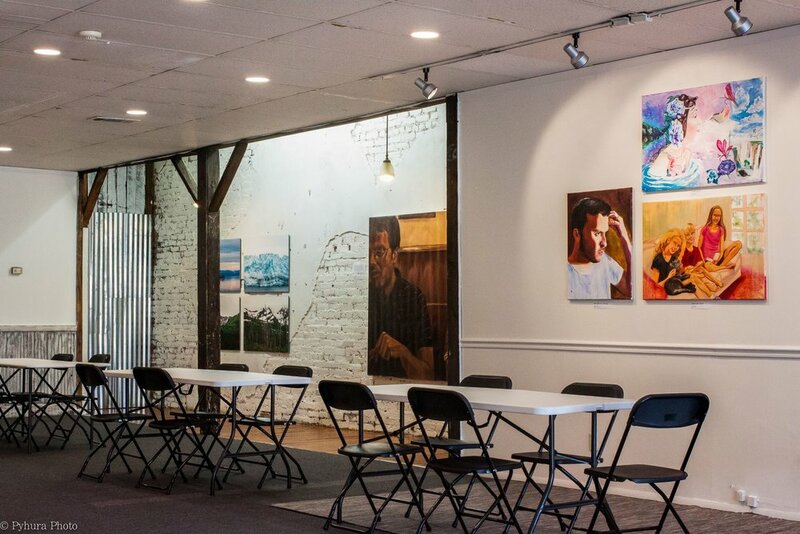 If you’re looking for a space to hold a meeting or host a workshop in the heart of downtown Macon, you’ve come to the right place. We can provide everything you need at an affordable price. For smaller meetings, we offer a convenient hourly rate. Chairs and 6-foot rectangular tables (up to 8) are included in all rentals. We are happy to set up the room for you either theater-style or classroom-style. After we set up the room, you are free to customize the set up to suit your preferences. The 567 is a unique, funky venue for your special day. If you want an artsy, urban feel for a small, intimate wedding reception, we have the space for you. We're also the perfect size for bridal showers. For rates and availability, or to schedule a tour, e-mail rentals@the567.org.